The trend in conventional linear and rotational applications is moving away from robots to energy-efficient and cost-optimized systems, as manufacturers often don’t require all the functions, large sizes and degrees of freedom robots provide. 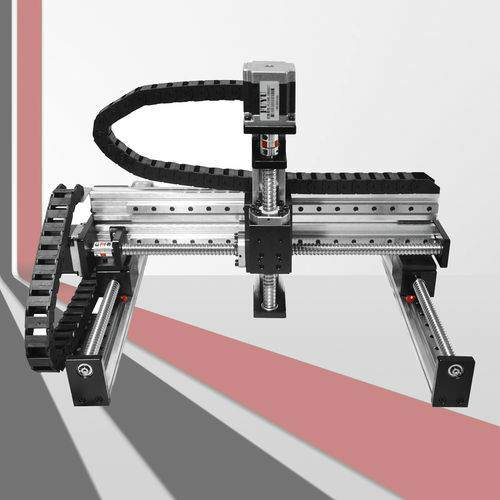 Although considered an industrial robot by DIN standards, Cartesian handling systems offer simpler and more energy efficient operations than most 4- to 6-axes, articulated arm robots. The DIN standard EN ISO 8373 states that “an industrial robot is an automatically controlled, reprogrammable, […] multipurpose manipulator, programmable in three or more axes, which may be either fixed in place or mobile for use in industrial automation applications.” However, the segmentation of such systems varies depending on the function, flexibility and dynamic response of the system. 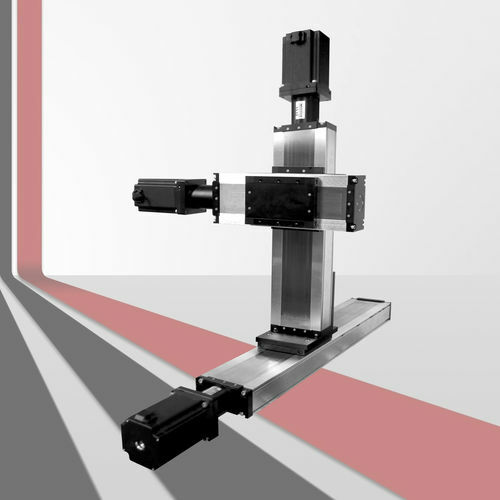 Cartesian handling systems and conventional robots with 4 to 6 axes have a relatively large overlap in terms of flexibility and dynamic response but differ when it comes to their mechanical system. 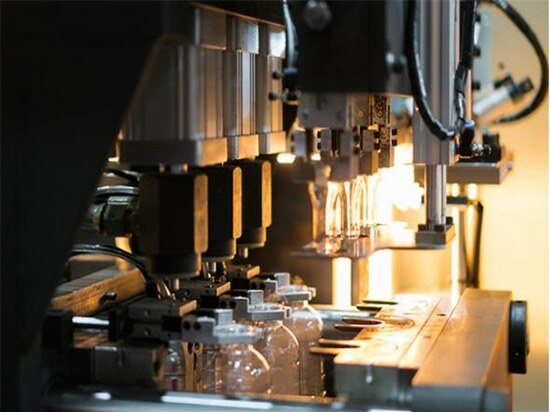 Depending on the application, Cartesian handling systems are controlled either by a simple PLC (which a user may already have) for point-to-point movements or by a complex control system with robotic functions, such as for path movement. The 4- to 6-axes robots always require a complex robot control system. Moreover, Cartesian handling systems require less space for movement and lend themselves more easily to custom and modular adaptation to application conditions. 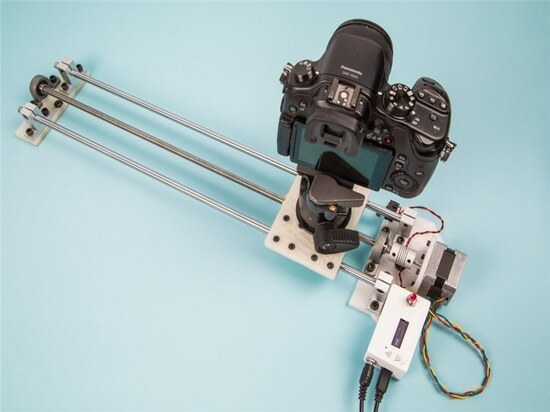 The work space can be adapted easily by changing the axis lengths. The kinematics are thus configured to suit the requirements of the application—in contrast to conventional robots where the application peripherals must be adapted to suit the mechanical and kinematic system of the robot. The mechanical system of a Cartesian handling system is therefore part of the total solution and must be integrated into the complete system. 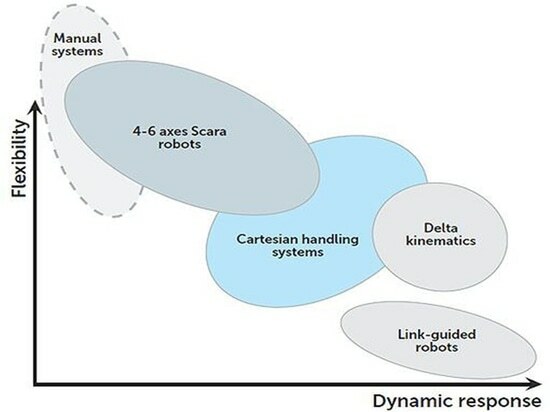 In contrast to standard solutions with 4- to 6-axes robots from the catalog, Cartesian handling systems can be customized in a modular fashion to suit the application (see Figure 3). These systems require virtually none of the compromises often found with conventional robots. With a conventional robot, parts of the application must be adapted to the requirements and capabilities of the robot. Also, the shift toward standardization and the use of mass-produced components reduces the cost of Cartesian solutions compared to conventional robots. 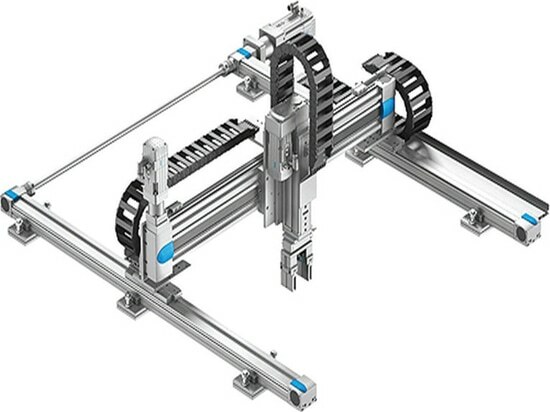 In addition, different drive technologies can be combined with Cartesian handling systems. The right pneumatic, servo-pneumatic and electric drives for the application are selected for each axis to achieve optimum movement in terms of efficiency, dynamic response and function. 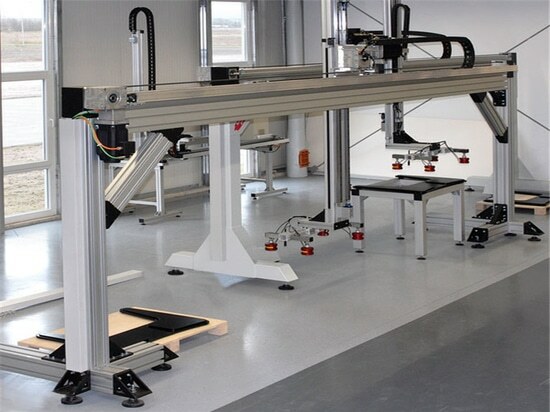 Cartesian handling systems as serial kinematics have main axes for straight-line motion and auxiliary axes for rotation. The system acts simultaneously as guide, support and drive and must be integrated into the application’s complete system regardless of the handling system structure.